Nondescript strip malls quietly fill Hollywood streets like banks in Beverly Hills, so after two years living in my Melrose Hill East Hollywood neighborhood, it's not terribly shocking that I'm still making discoveries only blocks from my home. In preparing for Taco Night with some friends at my place last week, I was having trouble finding the 4" small taco-sized tortillas. Once it was on my radar, boy was I surprised to see the word Tortilleria emblazoned on the first strip mall awning just North of my block. Inside of Gigante Panaderia y Tortilleria (936 N. Western Ave, LA Tel: 323.464.3139) is a mélange of formica booths, Mexican bread and pastry racks, cooler cases full of odds 'n ends, a hot food menu, and thankfully hot corn tortillas coming fresh out of a press, being wrapped in their plastic bags, steaming the interiors. The smallest bag of taco-sized tortillas was a stack of about 60. The woman behind the counter asked how many bags I would need. I laughed, one would do - which cost me $1.45. Unlike most corn tortillas, Gigante's don't split when you fold them. They are thick and have a finer texture than most, with a delicate flavor. Quite a find! 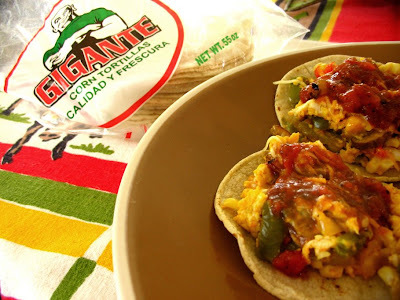 I used Gigante tortillas here for brunch tacos of scrambled eggs, nopalitos, roasted anaheim peppers, and a fire-roasted tomato salsa.